The flag of the Town of Fort MacLeod, Alberta, has a blue background. There are many elements on it as - town crest near the hoist, a white cloud, three wigwams, a fort, a building (the training center or saloon? ), on a yellow ground, down left and down right half-roses and four sticks, and on all sides incomplete blue lines. 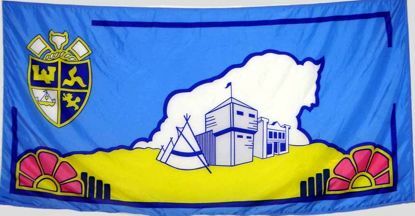 The unique flag of the Town of Fort Macleod has depictions of a teepee, fort and store in the center which reflects the community’s historical past to being an RCMP outpost as well as an important location for trade and commerce in Southern Alberta. A cloud formation on a light sky blue background represents a bison. On upper left hand corner of the flag is a simplified representation of the municipal coat of arms. On the lower left and right of the flag are two Wild Roses, the official floral emblem of Alberta. Fort Macleod is a town in the southwest corner of the province of Alberta, Canada. It is named in honour of the Royal Canadian Mounted Police Colonel James Macleod. Fort Macleod was recently chosen from 30 communities as the site for the proposed Alberta Police and Peace Officer Training Center, which is expected to cause an economic boom in the region. It has 3,072 inhabitants... Source: Wikipedia: Fort MacLeod, Alberta.